Even animals love a singing competition in SING, which must be, what, the 200th animated kid flick this year? Fortunately, although it's not a top tier effort, SING is at least entertaining. Probably moreso if you're in the under 12 year old target market than an old geezer like me and/or the modern pop hits being covered by the cast don't make you cringe (also me). Anyway, the plot is pretty simple. Koala Buster Moon (Matthew McConaughey) owns a theater, something that was his childhood dream. Unfortunately, all his productions bomb, and the bank is about to foreclose. In a last ditch effort to save his beloved venue, Buster decides to put on a singing competition ala 'American Idol' or 'The Voice', in which everyday animals get a chance to show their talents to the world. The prize is supposed to be $1000, but Buster's elderly lizard secretary accidentally prints up fliers offering 100 times that much. With that much at stake, all kinds of animals want in. 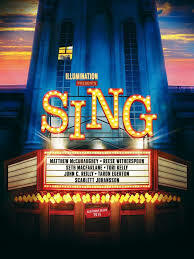 Only a few, however, make it past the auditions: Rosita (Reese Witherspoon) – an underappreciated housepig/stay at home mom, Mike (Seth McFarlane) – a shady mouse with a penchant for Sinatra, Ash (Scarlett Johansson), a punk rock porcupine whose boyfriend and musical partner keeps her out of the spotlight, and Johnny (Taron Egerton) – a young gorilla being pushed into a life of crime by his dad. Meena (Tori Kelly), an insecure young elephant with a powerful voice, can't bring herself to audition, but winds up working on the show as a stagehand. As one would expect, all the contestants have various obstacles in their personal lives that they must overcome to perform in the big show. Buster faces perhaps the biggest obstacle of them all when things literally come crashing down around him and it seems that all is lost. Ah, but the power of music, blah blah blah. Believe in yourself, yadda yadda yadda. You know the drill. It's lightweight and predictable, and certainly nowhere near the level of the best animated films of the past year (e.g. ZOOTOPIA, KUBO AND THE TWO STRINGS, even the not-as-good-as-the-first-one FINDING DORY), but it's an agreeable time killer. My 5 (almost 6) year old son liked it considerably more than me, with a gag referencing the opening lines of Sir Mix A Lot's "Baby Got Back" in particular making an impression. 2 ½ out of 4 stars.